J. Christian Adams, a DOJ attorney who resigned in protest, speaks out. Sound like the hysterical rantings of a crazed San Diego doom blogger? "We cannot stress enough how strongly we believe that a cliff-edge may be around the corner, for the global banking system (particularly in Europe) and for the global economy. Think the unthinkable," he said in a note to investors. San Diego's own Leslie Eastman happened to be on vacation in Italy when a Tea Party broke out. Members of the trans-Atlantic resistance movement swapped notes and tactics. Click on over to Temple of Mut for the story and pictures. Not that a real financial reform bill is likely even if this one stalls, but it would at least re-open the possibility of addressing Too Big To Fail. Ex-KKK leader and current Democratic Senator Robert Byrd's vote may be crucial to pass Frank (D - Fannie Mae) and Dodd's (D - Countrywide) fake financial reform bill. UPDATE: The Klansman has died; analysts expect this to delay, not kill, the fake financial reform bill. A two-minute illustration by an anarchist that quite accurately captures today's crony capitalism corruption regime. You did recognize Goldman Sachs and BP in that diagram, didn't you? Mainstream media "reporters" hate conservatives, share ideas on liberal groupthink e-mail lists before telling public what to think. We are shocked. Shocked, I tell you. Russia will scrap capital gains tax on long-term direct investment from 2011, President Dmitry Medvedev has said. "I would welcome real investors who can build factories, something new in this country." Also, many investors have been wary of coming to Russia because of corruption and the dominant role the state plays in Russia's business life. Carly Fiorina, who's gone from failed and despised CEO of Hewlett-Packard to hanger-on of the comically disastrous campaign of ultra-RINO John McCain, is finding no love in her next soon-to-fail endeavor. Rep. Bob Etheridge, caught on YouTube recently assaulting a student reporter, has a history of bullying children. This would be a reasonable op-ed, other than the fact that it was written by the idiot who destroyed the economy. It's behind a paywall, but don't worry. There's nothing there that hasn't been said on the WCV many times over. UPDATE: Free version here. Nice paywall, WSJ! 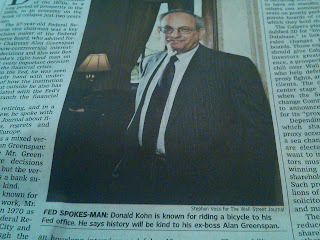 "He says history will be kind to his ex-boss Alan Greenspan." And in totally unrelated news, the dollar hit a new all-time low vs. gold today. UPDATE: There's a full version, as well as a note on the abridged version above, here. Given the recent post about CalPERS, now is a good time to remind WC readers that the word "Soviet" means "council" (or "Union") in Russian. Soviets were groups of workers' representatives in Russia. Basically, they were unions. They were even "unions of unions" (kinda like the AFL-CIO). The various "Soviets" steadily gained power in Russia in the early 1900's, and then they executed the 1917 Communist Revolution. Thanks for stopping by, Mr. President. But while you're here, don't just check out Greenspan's Body Count. You want to know what comes next, don't you? And pay attention, sir. You or your successors are going to have to choose between inflation and default. If you think my views are seditious, you should Flag Me, Obama. Government of the public employee unions, by the public employee unions, and for the public employee unions. The pension fund board does not need legislative approval to boost the state's contribution rate. Remarkably, he's one of the few lefties who publicly oppose Congressmen assaulting citizens. I say this without sarcasm or malice. We've got to support lefty bloggers when they (oh, so rarely) do the right thing. Apparently it's unethical to protect your family with sound money while trying to protect your country by advocating sound money. Because now that the government is responsible for everybody's health care, we can't have people making unhealthy choices that would be a burden on the state! Off to the Exercise Camp with you, fatty! Obama to pile another $50 billion of debt on future generations to bail out the fatcat public employee unions yet again. What does the NAACP stand for? This goes waaaay beyond stupid and oversensitive. This is so stupid it's like signs of the apocalypse stupid. The NAACP freaks out about a space-themed Hallmark card talking about black holes. They are sure it is a racist reference to "black whores." What's worse? Hallmark panics and pulls the cards. Not only much better benefits and job security, but much higher pay as well! 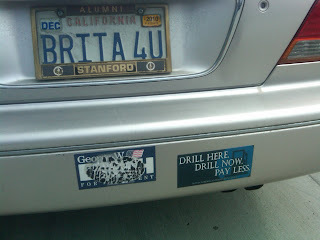 Hope you enjoy barely scraping by so that some government bureaucrat can retire at full pay at 60 or 65! How bout I pour you a nice Brita pitcher full of the Gulf of Mexico? Republican Liberty Caucus: It's Alive! Five years ago, I wrote off the Republican Liberty Caucus for dead. Well, they're back, likely inspired by the Ron Paul and Tea Party movements, and they had a big night Tuesday. Twenty-eight percent (28%) of U.S. Voters now say the country is heading in the right direction, according to a new Rasmussen Reports national telephone survey taken the week ending June 6. You know this guy is full of crap if he gets me to defend Goldman Sachs. In an op-ed in the Salem News, Michael D. "Mick" Pattinson, president of bankrupt developer Barratt American (builder of Leucadia's Rancho Tyvek Estates -- "Come for the tiny lots, stay for the low-income housing next door"), complains that it's not fair that some people on Wall Street recognized the housing bubble and bet that it would burst, or that some banks stopped lending to overleveraged developers as the housing market cratered. It looks like it was a good day nationally, and a bad day in California. Senator Blanche ObamaCare Lincoln lost her primary in Arkansas and will be retiring, and conservative candidate Sharron Angle beat establishment candidate Sue Lowden in Nevada. In California, no good news. Carly FAILorina, a RINO McCain-wannabe, beat libertarianish Tom Campbell and Tea Party favorite Chuck DeVore. In a year when Barbara Boxer should be vulnerable, FAILorina is so widely despised even among Republicans that she will lose in a landslide. Meg Whitman won easily and has a decent chance to beat Jerry Brown, at which point she will establish the second Schwarzenegger administration. Prop. 14, which will eliminate third-party candidates from the general election, passed. More bad news: RINOs Abel Maldonado and Mike Villines, who voted for the biggest state tax increase in the history of the U.S., won their primaries for higher offices. You see what happens, Larry, when you subpoena the wrong guys? Goldman Sachs buries Fincial Crisis Inquiry Commission under 2.5 billion pages. "We should not be forced to play 'Where's Waldo' on behalf of the American people," said Phil Angelides, the chairman of the inquiry commission, in an interview with reporters. "In our view their [Goldman Sachs] conduct has been extraordinary. They are outliers. The overwhelming number of people and institutions have complied and complied in a timely basis." UPDATE:She's gone! I don't know if that's a good thing. I like having the most vocal leftists on display to prominently show the MSM's bias. We've been talking about the Great Education scam for a yearandahalf. First -- as with the housing bubble -- cheap and readily available credit has let people borrow to finance education. They're willing to do so because of (1) consumer ignorance, as students (and, often, their parents) don't fully grasp just how harsh the impact of student loan payments will be after graduation; and (2) a belief that, whatever the cost, a college education is a necessary ticket to future prosperity. Big banks that took on high risks and generated unsustainable losses received a public benefit: TBTF support. As a result, more conservative banks were denied the market share that would have been theirs if mismanaged big banks had been allowed to go out of business. In essence, conservative banks faced publicly backed competition. Let me make my sentiments clear: It is my view that, by propping up deeply troubled big banks, authorities have eroded market discipline in the financial system. Hey, if we didn't have all these government cameras around recording us all the time, we'd miss moments like this. In related news, while the cops can always record you, you might be arrested for recording the cops. Here at the WCV, we've been advising underwater homedebtors to stop paying their mortgages for years. You've already saved ten or twenty thousand dollars, and have you noticed that the bank is still not bothering you? Keep living rent-free. When the bank (or government) finally does get around to calling you, they'll be very nice and accommodative, and they'll negotiate a very nice principal reduction for you.